From south-central Alaska southward along the coast on the west side of the Cascades to southern Oregon, and east to southwestern Yukon territory, Idaho and western Montana. Disjunct populations also occur on several islands in Michigan and Ontario. Climate varies from maritime, submarine, to continental types. Elevation ranges from sea level to 5000 feet. Roadside ditches. A dominant component of understories of various Pacific Northwest (and boreal) forests with moist to wet soil conditions. Seems to occur more often in mature to older forests (personal observation). Moist forests; wet ravines,drainage, or bottom areas; areas associated with hillside seeps and springs, stream corridors, or roadside ditches. Prefers shade and nitrogen-rich soils. A wet-site indicator. Primarily found in moist understories of late seral, climax, and old-growth forests. Best growth is attained in climax (mature) forests. Western hemlock, western redcedar, red alder, salmonberry, Vaccinium spp., ladyfern, mosses, foamflower and many other forbs. Flowers in late spring to midsummer, depending upon location. Fruits ripen approximately 4 weeks after flowering and persist through winter. Collect seeds when fruit turns dark red, usually late summer. Seeds are tan at maturity. Hand strip fruits from plants and collect in plastic bags. Take semi-softwood cuttings at budbreak, in late spring to early summer. Cut long stems from sprawling horizontal branches. Place in paper bags and keep moist. Similar Asian species have morpho-physiological dormancy. Suggested 72 hour running water soak, followed by a minimum of a 100 day cold moist stratification/100 day warm moist stratification/100 day cold moist stratification. Germinates the second year. Propagation is slow, either by seed or cuttings. Seeds: Extract and clean seeds. Stratify as described above, or sow in late fall and irrigate thoroughly prior to winter stratification. Should germinate the 2nd year. Cuttings: Cut stems into 13 cm sections containing at least one bud scale scar. Place in well-drained potting mix with perlite, with one half of the diameter above the soil. Keep cuttings outside in shade but irrigate. Can start in mistbed if available and then pot up and put in shadehouse. End distal to budscar usually roots. Harden over winter. Takes 1.5 years - outplant in 2nd September. Moist, rich soils preferred. Well to poorly drained with sandy, silty, or loamy textures ok. Both methods are slow, but seeds can be collected more easily. Outcome of each unknown. Shade required during seedling production and on ouplanting sites. Moist soils probably best. Information on devil's club regeneration is scant. Seedling growth is slow to moderate. Devil's club reproduces vegetatively, but the method is uncertain - possibly by rhizomes or layering. Initial establishment is slow. Cooke, Sarah S. 1997. A Field Guide to the Common Wetland Plants of Western Washington and Northwestern Oregon. Seattle Audubon Society, Seattle, WA. 393 pp. Network. URL: http://www.nativeplantnetwork.org (accessed 14 May 2003). Moscow (ID): University of Idaho, College of Natural Resources, Forest Research Nursery. Howard, Janet L. 1993. 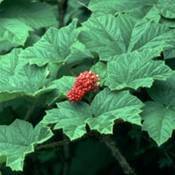 Oplopanax horridus. In: U.S. Department of Agriculture, Forest Service, Rocky Mountain Research Station, Fire Sciences Laboratory (2003, May). Fire Effects Information System, [Online].Available: http://www.fs.fed.us/database/feis/ [May 14, 2003]. King County, Washington. 1982. Wetland Plants of King County and Puget Sound Lowlands. King County, Washington. 78 pp.